Further advancing the rumors that Apple will announce a new store located in Grand Central Terminal, the Post says, "The store, to be Apple's fifth in Manhattan, will displace Charlie Palmer's Métrazur restaurant. Métrazur's partners are scouting new locations." The Post's source adds, "To make room, Grand Central may open the vacant northeast balcony, next to Michael Jordan's Steakhouse." A partner for Métrazur told the Post it's all just a "rumor." According to its website, "Métrazur [was] named for a commuter train that once ran along the Cote d'Azur en route to Monaco." So maybe they can find space at Penn Station? The Métrazur website also has a quote, presumably from Palmer, "When I stand at the top of the staircase and look out into the terminal, it's like cooking in the center of the world." - well, pretty sad departure, if it's true. 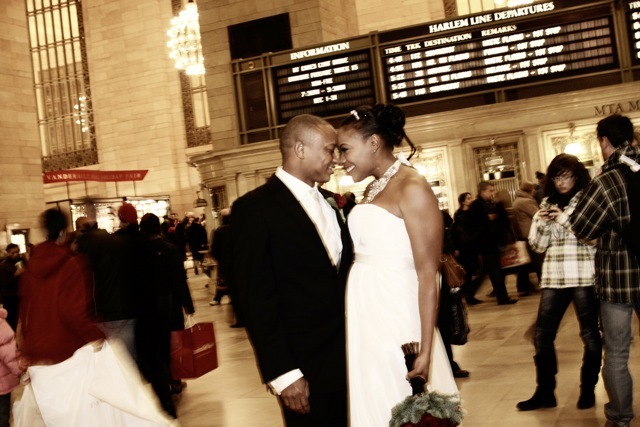 Here is a Grand Central elopement for a couple married by Eileen. Love the people texting and paying no attention!